At a recent business dinner, my table of four wanted to try a couple Pinot Noirs in succession. Half way through dinner, this Sonoma Coast bottling followed on the heels of a big-name Willamette Valley wine from Oregon. Everyone perked up when they tasted this wine, and it was unanimously selected as the better wine. I found this to be interesting as the Fogdog Pinot Noir was a bit more plush and rich than the first offering. A long debate could have ensued about the merits of Oregon Pinot versus California Central Coast Pinot, but it was getting late so we grabbed the check and headed out. This wine runs about $30 retail and represents the varietal fairly well. 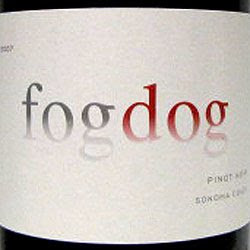 The competition is stiff for Pinot Noir in this price range, but Fogdog is worth grabbing if you see it. Raise a glass!